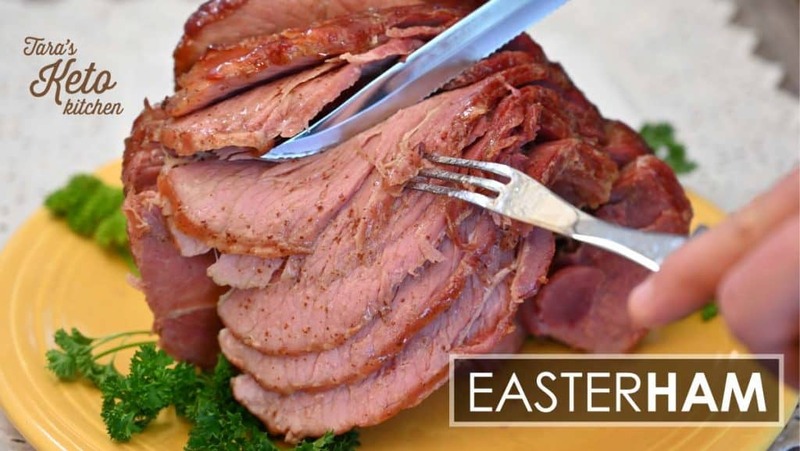 I wanted to create a sugar free glazed ham that tasted just like the real thing so we could have a Keto Easter Dinner. I searched the internet for sugar free glaze recipes and came up with very few. Most of them used ingredients I personally avoid having learned how toxic they are to me personally. Next, I pulled out family recipes and started creating this glaze that worked perfectly. In the sugar free glaze recipe I use a mixture of two different sweeteners to provide a full flavor. If you need to pick just one sweetener, I recommend Bocha Sweet. More on substitutions later. I grew up on a small farm in central Iowa, literally in the middle of nowhere. I share this because I grew up eating really good quality ham and the first time I tried ham as a person outside the home I went “EEEEW”. Later, I figured out that not all hams are created equal. When you are following a keto diet, choosing a high quality ham becomes even more important. Most ham is cured with sugar and the amount of sugar varies widely. There are a number of ways to get a hold of products NOT stocked in your local grocers. I'll share a few tips for ham below. Remember, that your voice… your vote… shapes what is carried locally. The more of us that speak up and ask for products without sugar the faster things will change. If you have a grocer with a meat department, ask them about finding a ham without sugar. They may be able to order in something custom for you! One of the benefits of living in a rural or farming community is that they often have a meat locker. Call around and ask if they have ham's cured without sugar. Search for specialty meat shops in your area and call and see if they have ham cured without sugar. Look around for local co-ops which may carry meat items. In our area we have 3-4 places we can order higher quality meat from and most of them carry a low sugar ham. As long as you aren't following a very strict Keto Diet for health reasons, a little sugar in the ham is likely okay. Read the label very closely and then the ingredient list. The higher up in the list the ingredient is, the more of the ingredient that's in the food. If the ham label lists sugar as the FIRST ingredient. Keep looking. If some kind of sugar is last on the label… this one is probably just fine. The ham we used here had a whole sugar as the last item on the ingredient list. Knowing this, we kept servings a little smaller and made sure we paired it with plenty of fat. OUR personal ketone testing showed no impact on our ketone or blood sugar levels. I have friends and family who order a ham MONTHS in advance of a dinner! This is a great strategy when you're following a keto diet. Keto Ingredients To Watch Out For! Watch out for the brown mustard! Shockingly, you'll find ingredients like sugar, dextrose, maple sugar hidden in brown mustard!! So, grab your bottle of mustard and read those ingredients. I've linked to a brand of brown mustard that has no sugar in it. This sugar free glazed ham recipe is so delicious your family won't even notice the sugar is missing! I've used general cooking times below, make sure you follow the package directions for total cooking time customized to your specific ham and ham size. In a small saucepan over low heat, stir together water and Bocha Sweet until granules are completely dissolved. Remove pan from heat and whisk in the remaining ingredients. Be careful adding the xanthan gum because it tends to clump. You may need to use a blender or an immersion blender to completely mix in the xanthan gum! It can be tricky. If frozen, allow the ham to completely thaw in the refrigerator. This may take up to 72 hours. Wrap a baking pan completely in foil. Lay out additional foil on top of pan – enough to cover the ham. Lay ham on foil flat side down and bring the foil up around the ham, covering it. Make a small opening in the foil big enough to allow your meat thermometer to be inserted without making contact with the foil. Insert the meat thermometer making sure not to insert it into the bone. Place ham in oven. If your thermometer connects to your oven internally, make the connection at this time. If not, place the ham in a way that allows you to easily check the temperature by looking through the glass. Bake at 350F until ham reaches 105F. Remove ham from oven, remove foil and baste with up to half of Bourbon Glaze. Place ham (uncovered) back in oven and bake to 140F. Remove ham from oven and baste with the remainder of Bourbon Glaze. Nutrition facts do not include ham. They are for one full recipe of the maple-bourbon glaze and do not include sugar alcohols from the alternative sweeteners. You may have noticed that we cooked our ham to a specific temperature. If your ham has instructions that calls for cooking it a specific way, feel free to follow those instructions. We want you to have the very best Keto Ham possible, and cooking per the package instructions may yield the best results. Of course, we hope you will glaze it with the Sugar Free Maple-Bourbon Glaze that we used for our delicious Keto Ham. What makes this oven so versatile is that it really can replace several of the appliances you already have, or don't have yet. We have used it as an oven, broiler and dehydrator; we have even trained our teenage daughters to use the June as a replacement for the toaster. It is really fun to be able to peak in on a cook cycle and see how my latest batch of keto cupcakes is coming along. If I were going to buy just one kitchen appliance for my children as leave the home and start their own families, it would be the June Oven.